The Breslow Center is proud to offer miraDry’s FDA-approved treatment for excessive underarm sweat to patients in the Paramus, NJ area. The sweat stops here! miraDry is an FDA-cleared, non-surgical procedure for treating underarm sweating and odor. The treatment uses a handheld device to administer electromagnetic energy to the underarm area in order to permanently eliminate sweat glands. Patients can expect a significant reduction in underarm sweating, not to mention the physical discomfort, embarrassment and odor that goes along with it. And since the sweat glands that are treated do not grow back, miraDry is a permanent, non-invasive solution to this problem. 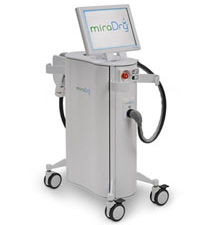 miraDry is also the first and only FDA cleared device for the non­invasive treatment of odor. It is proven to reduce underarm sweat by delivering localized heat to the area where the eccrine sweat glands reside, and in many patients the device also thermally impacts and eliminates the apocrine glands that are responsible for bad body odor. Will miraDry Affect Your Body’s Ability to Sweat? The underarm area contains only 2 percent of the sweat glands on the body, the total amount of which is over 4 million. Because of this, a miraDry treatment will not interfere with the body’s ability to cool itself through sweating. Which is most effective, miraDry or Botox? 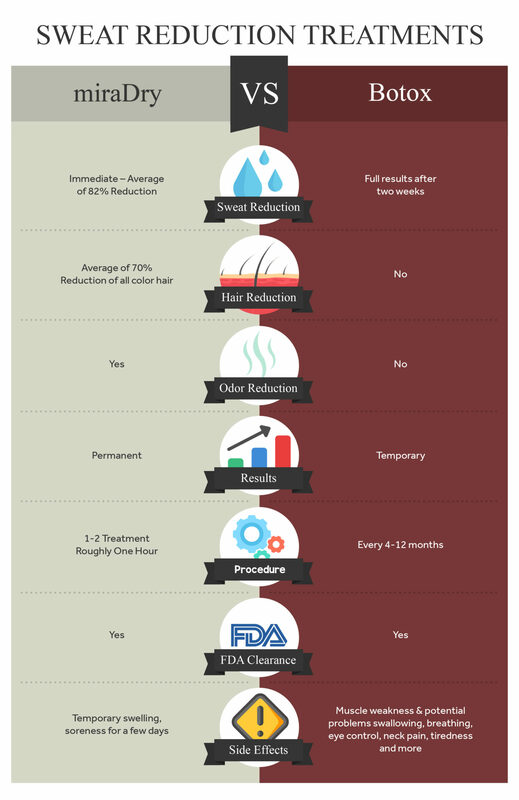 As shown in the graphic below, miraDry presents several advantages over Botox. Not only is it permanent and therefore more cost-effective, but it’s also a more efficient way to deal with excessive sweating. Are You a Good Candidate for a miraDry Treatment? What is a miraDry Treatment Like? A miraDry treatment is usually completed over two procedures performed approximately three months apart, with each procedure taking about one hour. Local anesthesia is used to numb the underarm area and a handheld device is applied to the surface of the skin that delivers electromagnetic energy to the treatment area. The patient won’t feel any discomfort, but only some slight pressure, during the process. As a non-invasive treatment, there is usually minimal downtime after a miraDry treatment. The patient may experience minimal soreness and swelling, which typically subsides within a few weeks. Any discomfort experienced by the patient will be mild and can be relieved with an over-the-counter pain medication. Ice packs can also be used for pain relief and help with the swelling. Patients are able to return to work immediately and to exercise after the first week. Results will be experienced immediately. I have suffered from hyperhidrosis ever since I hit puberty at a young age. It was very embarrassing having underarm sweat stains constantly, weather I was sweating from anxiety, the temperature or just nothing at all… So once I heard about miraDry, I was super excited. I am a 24 years old and decided this one-time procedure was right for me! It significantly reduced my underarm sweat & odor and I can say it is LIFE CHANGING! Not to mention the staff at The Breslow Center’s office was super comforting through the procedure. I highly recommend this treatment for anyone with hyperhidrosis or those who do not want sweaty underarms! 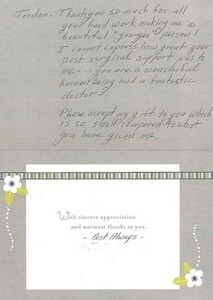 Thank you so much, Breslow Center! Would you like to stop unsightly sweat stains on your clothing, embarrassing odor and sopping wet underarms? Learn more about the advanced miraDry technology and how it can help you eliminate these problems for good! If you have questions regarding miraDry, contact The Breslow Center in Paramus, New Jersey for a consultation. We can answer any questions you may have and schedule your treatment. Call us today!